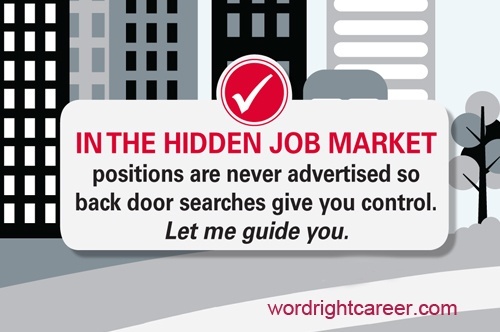 As promised, over the next few months, I’ll expand on the Hidden Job Market with a view to continue clarifying fact from fiction – even when it sounds like fiction! Here’s a story – based on fact – of how some jobs don’t even exist until the right person appears. It could be your story. To your new employer it’s all been an exercise in good fortune! The fact that the firm recognized that they needed your qualifications, that they were able to establish a substantial budget out of thin air for a new position, and persuading you to say yes to the challenge, was all serendipity. First, there was absolutely nothing coincidental about them finding you. You had your eye on that company for a while. You knew you’d be a great fit. This is where your version of the story really begins. There was no point in denying it – your current position wasn’t a happy place for you anymore. From where you were sitting in your corner office, you knew change was coming down the pike. A career move was essential. For the first time in years, you felt that quiver of uncertainty about your career. You had a few sleepless nights, worried about how change would affect your family, wondering where you could land that would provide a comparable lifestyle – or better. You asked yourself where you could find an engaging challenge: the questions seemed endless. The answers didn’t present as quickly. But you’d “lived in interesting times” before. Here’s what you would do. Like countless other business decisions you’d made over the years, you’d consult with an expert and, together, you’d develop a customized plan. This time, however, it would be a career strategist and you’d be the product being brought to market. During these rigorous strategy meetings, you examined yourself and imagined yourself as a product to be branded (if you will). You outlined features of ‘you’ as a product – what new skills had you honed over your career (without realizing), what kinds of problems you’d solved (and enjoyed) and what centres of influence you’d formed (and their power). This was all good stuff and worth the effort. Although, during this consultative process, when you were informed that the Hidden Job Market consisted not only of all those executive level jobs that would never be advertised but, in some cases, the market included positions that didn’t even exist yet, it’s fair to say you viewed this idea with a bit of a jaundiced eye. But you ran with it, as advised, and allowed your imagination to take over, also as advised. If the world was indeed your oyster, where would you like to work every day, and what solutions would you enjoy bringing to that organization? Presto! (except in this case ‘presto’ means countless hours of hard work!) The idea that some jobs don’t even exist until the right person appears proved true. Your new job didn’t exist until you were strategic and brought a solution to an exhausted CEO who desperately needed a win. As for the company’s version of how they found you, well that works just fine for you. You’ll accept that you were a lucky find. Sure, why not. In fact, you’re the exact person they didn’t even know they needed. In my time as a career strategist, I can cite many other examples of how some jobs don’t even exist until the right person appears. In my last blog, How to find a C-level Job that Isn’t Advertised, consider the group of executives too busy to find the right person to share the corporate load. There’s a presto! there somewhere. I’m Maureen Farmer and I’m an awarding-winning, executive career strategist. If change is in the wind and you need me, contact me today. Together we will produce a powerful strategy for taking charge of your career.